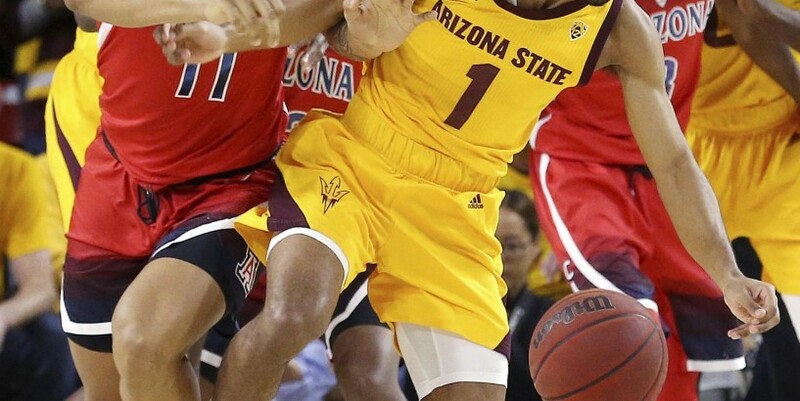 TEMPE, Ariz. (AP) - Remy Martin scored a career-high 31 points, eight in overtime, and Arizona State ended a six-game losing streak against arch-rival Arizona with a 95-88 victory over the Wildcats on Thursday night. Rob Edwards added 19 points for the Sun Devils (15-6, 6-3 Pac-12) in Bobby Hurley’s first win over Sean Miller’s Wildcats since becoming the Arizona State coach four seasons ago. Zylan Cheatham had 11 points and a career-high 21 rebounds, two games after grabbing 20 boards at UCLA. Arizona State scored the first seven points of the overtime, Martin’s 3-pointer putting the Sun Devils ahead 90-83 with 3:08 to play. Arizona never got closer than four again. White’s dunk capped a 6-0 spurt that put Arizona State up 34-27 with 44 seconds left in the half. Coleman and Luther each sank a 3 in the waning second of the half to cut the Sun Devils’ lead to 36-33 at the break. Rumello White’s dunk, followed by Martin’s 3-pointer, gave Arizona State its biggest lead, 44-35, with 18:52 left. But the Wildcat used a 10-2 run to get back into it, Coleman’s‘ 3-pointer cut it to 46-45 with 16:31 left. Arizona took its first lead since the opening minutes on Randolph’s running bank shot that gave Arizona a 61-59 lead 8:13 remaining and Luther’s second 3 of the half put Arizona ahead 67-61. Martin brought the Sun Devils back, sinking consecutive 3s and scoring on a reverse layup in traffic to put Arizona State ahead 73-72 and Cheatham’s dunk had Arizona State up 75-72 with 3:20 left. The teams traded baskets from there before Coleman’s 3 tied it at 83-83 with 24 seconds left and the game headed to overtime. Arizona welcomed the return of Chase Jeter, who missed the two losses in Los Angeles with a sore back, but couldn’t come up with the big plays it needed in the overtime in the loud, packed Wells Fargo Arena. Unlike previous years, the crowd was not dominated by Arizona fans.